Born into a happy litter, Etzel is soon snatched from his brothers and sisters and taken to be brutally trained into being a tough, heartless police dog. Sensitive readers may have a hard time reading about the vicious kicks that come from the humans who are training the dog. This period in Etzel's life is short as he is put up for sale and discovered by Larry Trimble, a Hollywood film director who is searching the world for a canine dog star. He wants a noble dog, a dog with heart, a smart dog and when Mr. Trimble sees Etzel, he knows he has found his star. 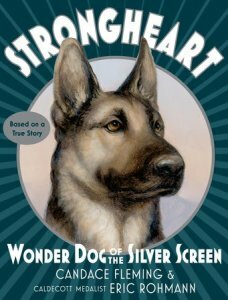 Short chapters, illustrated with beautifully touching pictures drawn by a man who knows and cares about dogs, the story quickly traces Etzel's metamorphosis into Strongheart, star of silent films in the 1920s. It's easy to be astonished by this dog's ability to understand human speech and to portray emotion and character in the six movies he made. He truly was a wonder. The story rises and falls around Strongheart's uncanny abilities including his police dog intuition for nosing out criminals and people with bad intentions. A blend of fact and fiction, the story comes to a close as the star finds himself in jail accused of a dastardly crime. A wonderful, sympathetic story that will touch children who know how it feels to be given a second chance at life and will amaze all who love dogs and perhaps even a few cat lovers as well. Heartwarming, astonishing and keenly empathetic for all who have been abused and had a chance to trust the world again.